Be inspired by the things you love. Design is a plan for arranging things in such a way as best to accomplish a particular purpose. Whether it's building a home from the ground up or just one existing space, exceptional interior design is a culmination of the client’s style and needs with our experience and methodology. Working together, we can achieve the functionality required and the aesthetic flair desired. A beautifully crafted bath or kitchen remodel adds optimum value to your home. We stay current and at the leading edge so you can truly have the kitchen and/or bathroom of your dreams. 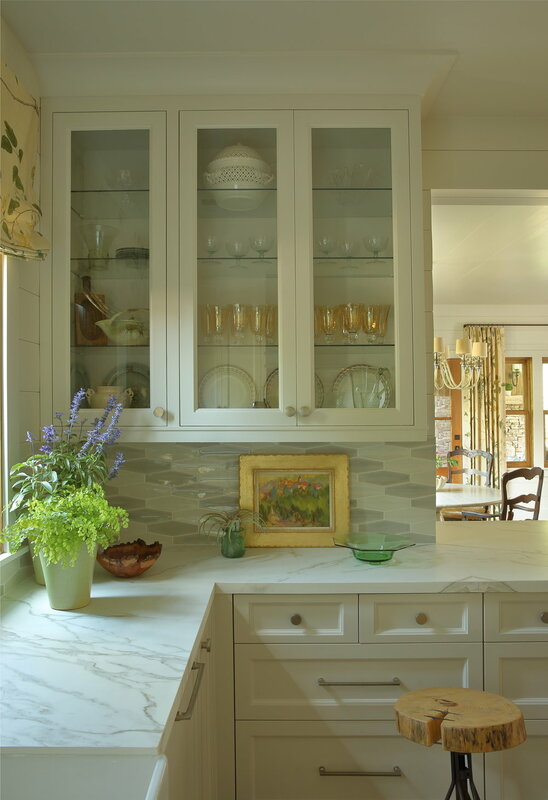 With attention to detail backed by extensive research, McLaurin Interiors is skilled at returning a space to its past glories…and integrating the conveniences of today with the look of yesterday. A round walnut pedestal table takes center stage. Fluid lines and graceful curves define the surrounding furniture pieces. By the fireplace, two updated classic wing chairs offer comfortable seating for enjoying morning coffee or tea. An antique ibis console, dating from the American arts and crafts era, coordinates nicely with a black lacquered Italian chair and a predominately light and wispy abstract oil painting. When you think of mountain areas, you think of texture.. stone, wood, grasses, ferns, fur, and so forth. There are so many natural elements that complete the feel. There's elegance mixed with rough simplicity. The soft warmth of the leather chairs and the smoothness of the travertine table mixed with the rush seats of the Provencal chairs and rugged stone fireplace all add to the ambiance. The antique rugs serve a purpose in delegating spaces, but also add warmth and softness. One comes to the mountains to find respite from the busy lives we lead. My goal was to use refreshing colors and collected materials to create a serene and welcoming space. These were the requests of a savvy, career-focused Georgia Tech grad couple for their main living area. A worn, tufted vintage sofa was refurbished with a gray and white large stripe fabric contrasting nicely with the intricately carved sofa arms. Also on the list of must-haves, two Barcelona chairs which contrast sharply with the curves of the sofa and cocktail table. The combination of grays, smoky charcoal and whites accented with burnished gold and fresh teal throughout provides continuity as the room pieces blend together with subtle elegance and modern drama. A stately home built in 1987 was in need of an update. The foyer, although two stories in height, was dimly lit and unimpressive. The adjacent study with tall windows covered with brown plantation shutters was dark and dated. One of the first design suggestions to which the homeowners readily agreed was to widen the living room entrance to bring in light and create a view from the foyer. Traditional arched built-ins were replaced with custom shelving backed with mirrors to house collections of glassware and sculpture. Displays of antique lithographs, wood cuts and engravings were placed artfully throughout. The Kitchen, remodeled for ease of use, has a contemporary feel. In the Master Bath, the dated whirlpool tub was removed. 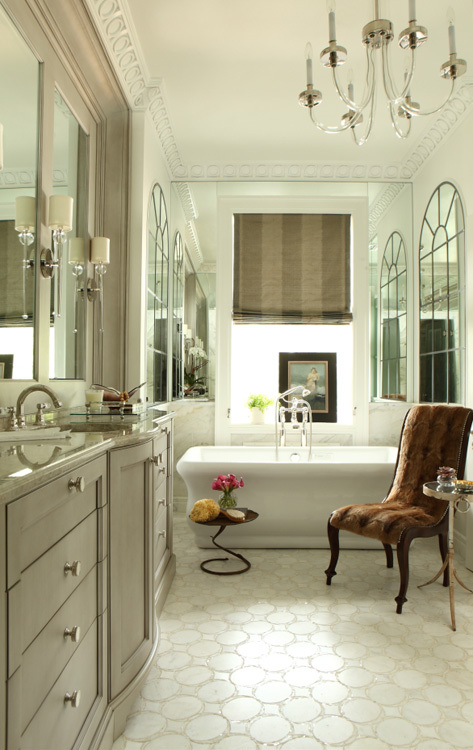 The once vaulted ceiling lowered to 10 feet not only gives the bath an updated look but conserves energy as well.The homeowners opted for clean line cabinetry with storage hidden behind a bank of mirrors. A fresh coat of creamy white paint on the dark stained plank walls makes the room light and airy. The stone fireplace now becomes a cozy focal point with a 40" vintage mirror suspended by chain. Replacing the existing ceiling fan with a round oak and iron chandelier fills the space with soft light. The furniture was selected to accommodate guests enjoying a cup of coffee and a book while waiting to join their hosts in the main house or relaxing in the evening by the fireplace with a night cap before bed.